In the final part of our conversation, Footballguys IDP guru Jene Bramel discusses the possibilities for Mathias Kiwanuka’s role in New York, the roles of tiers in fantasy drafting, and what I believe is the absolute best scoring system to reflect the value of very position in an IDP/Offensive Player combo league. You have to see it. 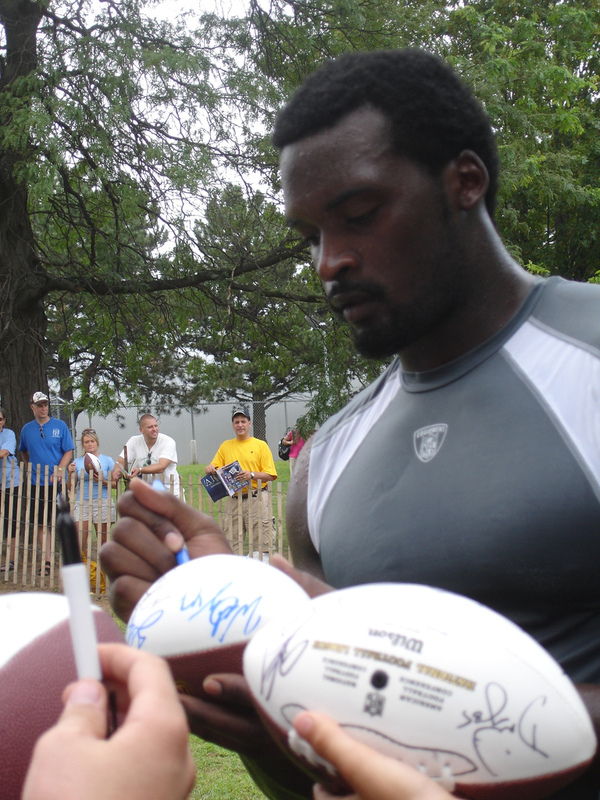 Waldman: Tell me your thoughts about Mathias Kiwanuka and the Joker Package. He was off to a great start last year before the herniated disc. Do you think the Giants will surprise with this combo of Tuck, Pierre Paul, Kiwanuka, and Umenyiora. Bramel: The Giants have a couple of things going on. They had that “Big” package last year where they took bigger linebackers and put them on the strong side. My first thought is it might be akin to what Terrell Suggs might be doing with the Ravens, but I’m not 100 percent positive on that. Kiawanuka is so versatile that they can put him in a whole lot of different packages. I’m just not positive what that specific terminology refers to. My guess based on the context you supplied is that it is going to be a pass rushing subpackage and the Giants will move him around the line to generate some mismatches that might be more the equivalent of an Elephant package with former 49er/Cowboy Charles Haley. Terrell Suggs has done some of that, too. Seattle also did that with Chris Clemens last year. Waldman:Who are some of your favorite current football players? Bramel: That’s a tough question for me to answer because I follow so many players and teams on the defensive side of the ball that I don’t focus on any of them in particular. I like those all-around outside linebackers that can pressure the passer and play the run. I think James Harrison is a guy that you just have to be drawn to. Pass rusher-wise, there’s just so many that I follow. There’s not just one guy where I have to have his jersey or make it a point to go see in person. I just like how they all play together. It’s a good question, not sure if it’s a good answer. Waldman: When did you first participate in an IDP league? Bramel: Footballguys.com’s John Norton who was probably the first guy to write about IDP from a fantasy football standpoint with the site Fantasy Insights. He caught my attention because he lived down the road from me. We were all online during the early days of the Internet and we were looking for fantasy football information between classes. I noticed that he lived just about 10 minutes from where I grew up. It was 1997-98 and he got me more interested in defensive players in fantasy football. I got into an IDP league with (Footballguy) Bob Henry and few other guys who wrote for the Fantasy Insights at the time. That’s what started the love. There’s maybe a spare re-draft or two that I’ll play in that uses team defenses, but for the most part I haven’t been interested in playing fantasy football without individual defensive players for about 15 years now. Waldman: I wish I had more time recently to devote to IDP as a writer, but what you guys do with it is so great. I would encourage anyone who plays fantasy football to try a good IDP league. Actually, we’re in the middle of a draft right for a great league. Writers like ESPNs’ Matt Williamson, Footballguys’ Sigmund Bloom, Rotoworld’s Evan Silva, and a bunch of other known guys are competing in it. I believe without a shadow of doubt that the league has the best way to score IDP and offensive players that I have ever come across. Every position is valuable. Explain how you developed this scoring system and why. Bramel: The impetus for doing this was being a lover of all things IDP and raising the defensive player in the consciousness in fantasy football. A big reason they don’t get their due is that most fantasy leagues scoring systems don’t give them enough value. Even those of us who love defensive players say you don’t need to be thinking about drafting your first linebacker until at least the eighth or ninth round and sometimes even later. There were times last year even in very competitive situations where I didn’t take my first IDP until the 11th or 12th round. That’s just not right. The impetus for this league was to elevate the defensive player to having equal value, if not in some cases a little bit more relative value than offensive players so your eyes would be drawn to them on a weekly basis. If you’re going to do that then you make a couple of classes of linebacker and a couple of classes of defensive lineman and defensive backs equal to running backs, quarterbacks, and wide receivers. This is fantasy football so we don’t necessarily have to reflect the very best cornerback having the most value as the best quarterback. We’re still stuck on the statistics. What drew me to make this kind of a scoring system was the challenge of it all. Every draft pick all the way into the later draft rounds you’re presented with a true choice at almost every position. There’s an argument in the first round that you’re probably not going to want to consider a cornerback. However, in this particular league we did have six running backs, two quarterbacks, three defensive ends, and a tight end go in the first round. We had a defensive tackle go very early in the second. We had a cornerback and a safety go long before any IDP would have gone in a traditional scoring system. Waldman: Hell, I didn’t pick a running back until the 11th round! Bramel: I know that you took some heat for that in the Footballguys Shark Pool Message Board, but yours was a very valid strategy. Even in a traditional league, you have a lot of ways to strategize for your draft but you’re typically looking at four running backs, maybe two wide receivers, and a quarterback you want to look at in the first round. In a league like this you have to make that decision between different classes of linebackers, different classes of defensive ends, different classes of running backs and wide receivers, and all of those positions at the same time. Because how valuable some of these players are, if you choose one position in lieu of another, you’re going to have to live with the consequences of not getting a running back until the 11th round. If it makes sense – and it may – strategy wise or relative value wise, that you may be well ahead of the game by taking a tight end first and picking a linebacker in the next four rounds as you did. But what you can’t do is go back to your consistent list and say I’ve always drafted stud running backs and then considered quarterback, receiver, tight end. You can’t do that here. You will get left way behind at the defensive end or linebacker position. The values at each position are equal enough that it not only makes drafting more challenging but your inseason lineup decisions become that much more important. Bramel: …despite that, my draft board with first-round grades had six running backs, two wide receivers, two quarterbacks, four tight ends, four defensive ends and a defensive tackle, maybe one safety, and really no linebackers. To me all of those players could have been given a 1.01 grade. If we continue to do this one of the tweaks we might want to do is figure out a way to allow people to choose their draft spot. Because arguably your 1.01 draft spot was the worst spot to have in this league. Even though you know you’re going to get two pretty juicy picks on the turn, but after that first turn it gets a little bit painful because you’re on the opposite side of runs and you have to anticipate so much. While this league mitigates the issue of runs because each tier has enough players to get the 1.10 pick in this league was going to be a player with the same value as the 1.01. In your case, you took four linebackers who no one is going to be able to match up with. You know you’re going to slough on defensive end, but the way you matched two consistent guys (Patrick Willis and Jerod Mayo) with two big-play guys (Clay Mathews and DeMarcus Ware) it’s going to be harder for someone to play match ups against you. On the other hand you might have to find a waiver wire defensive end or cornerback, but you’ll have an easier time doing that than your opponents will with a waiver wire linebacker. Waldman: Picking these linebackers felt a lot like picking wide receivers in a traditional offense-only league. Willis and Mayo were like my 90-catch Larry Fitzgerald and Wes Welker types. And Mathews and Ware felt more like deep threats in the mold of Calvin Johnson and DeSean Jackson who were capable of huge days. Bramel: Those OLBs aren’t going to hurt you much when they have “down” weeks, either. But when they have big weeks they are going to win you games. Waldman: That’s such a parallel to the WR position. It was a lot of fun to see it that way. It allows more imagination to your draft, which increases the fun factor. I appreciate you guys developing this and we get more leagues to adopt it. Bramel: I hope we can get more people to adopt it. Certainly in IDP leagues where people are serious about playing with defensive players. This league is a test of everything that you know: player value, roster management, and drafting skill. I think it’s a great way to do it. Waldman: What I like about this IDP league is that it doesn’t foray into financial management or auction strategy. That can be fun, but it’s a simple, clean draft that tweaks the rules to make the best at every position equally valuable relative to other positions. It doesn’t complicate the valuation of talent. It opens up the entire game. It’s going to be the best draft I participate in all year – even if my team bombs – because of the changes you made to elevate the importance of every position in a lineup. Bramel: I know that ESPN’s Matt Williamson has been talking it up and Twitter and I hope we can push this as not your father’s fantasy football league. I’ve put together a couple of leagues like this before, but it was never pushed to the extent where fantasy owners would have to overcome their positional biases. Waldman: Staying with the subject of fantasy football, Sigmund Bloom describes you as a methodically painful drafter that he hates to draft against because any opening he leaves open you’re going to pounce. Do you think he’s right about your draft style? Bramel: I would like to think he is and I would like to think that most of my competition thinks I’m painful to draft with because, assuming we all know what we’re talking about, it means that I do a good job of drafting. I would like to think that I’m methodical. Bloom and I focus on using tiers in drafting for value. I’m sure that people chuckle when I saw that phrase, “drafting for value,” because they probably think of course that’s what you do. Well there’s a lot of pitfalls for drafting that way. You can get hung up on a running back who is available that you see is a value, but you already have three on your roster and you really don’t need that guy. Yet you’re picking him anyway because he is the highest value on the board. Or, you get hung up within tiers and instead of filling out a lineup with a position that you probably need you rationalize that the guy isn’t high enough within your tier and you pass him by. I think methodical is a good way to describe it, but there’s an art to it as well. You sometimes have to look at what teams on either side of you are doing. But with someone like you, I’ve learned that you may not need a top tight end because you already have one, but it won’t stop you from taking one if it makes sense with the scoring system. There’s an art to see what teams are doing around you and figuring out how to react to that so you can anticipate runs or not get caught up in them. There’s a decent balance between looking at the stats for your tiers to decide what the numbers should do and the art. Maybe I can zig here and get that player a round or two later. Waldman: I think the tier approach is very important and I think it gives you the chance to see the forest through the trees in the sense of understanding where these cutoffs are and this helps a fantasy owner understand how to develop that craft. Drafting is a craft. It’s about understanding the various ways you build a successful team through that process. You have to learn the rules to help guide you in a direction, but at some point you have to learn where that rule doesn’t apply. Knowing where those lines begin and end is what helps a fantasy owner make strong decisions. It’s like what Bruce Lee taught in the field of martial arts. The philosophy seems to be built on reacting to what the opponent does, but it’s also ground in thousands of years of tradition. However he frees the art from those rules within those traditions so the lines that define things are more flexible. People can become so heavily reliant on boundaries or traditions that those very things can limit them rather than free them. Having tiers can be a way to allow a fantasy owner to break free from conventions that could otherwise limit them. Bramel: I agree that it’s about flexibility. I always liken it to a difference in NFL playbooks. There’s a lot of different ways to play good defense. You can have a good zone blitz scheme. You can play a Cover Two. You can run blitz overloads and be highly aggressive like the 46 with Buddy Ryan or what Rob and Rex Ryan are doing currently to evolve it. But all of these defensive schemes can be effective. You’re using the same framework: you have to have enough guys in the box to stop the run and you have to have enough players in coverage or bring enough guys in pass rush to stop the pass. In the same way, you can be successful with the Stud RB beginning or the quarterback by committee approach. Or, it is sound to try something like your Upside Down Draft Strategy or to go into the draft without a defined plan and attack by taking the highest player in given tiers knowing that you need to have depth at positions that don’t have good relative value and plenty of studs elsewhere to make up for that. It’s all the prep work that you do that allows you to make these decisions. I have never bothered to do an IDP League precisely because the best IDP players don’t go until the 8th round or so in traditional drafts. What’s the point? Why bother get involved if the defensive players are so poorly thought of? So I like the idea of this scoring system very much and I hope it catches on. IDP leagues rule. Way more fun than just offensive players – even if they don’t generally score as well as offensive players. Completely agree. If I could only play in one league it would be a combo IDP/Offense league. No doubt. Watching Justin Tuck is just as fun as watching Rob Gronkowski. Glad you commented. Dr. Jene’s IDP guidance combined with Upside Down drafting has worked wonderfully in my drafts so far. Totally agree with the sentiment about equalizing scoring on each side of the ball – hope this breaks out.